I spent a really long time trying to figure out something original and different to share for this post. But in the end, the only thing I could really come up with would be a letter to myself. I'm not sure why, but that's what my mind kept coming back to. Some of these letters in the book really spoke to me, made me understand that I really am not alone out there with my thoughts and problems. 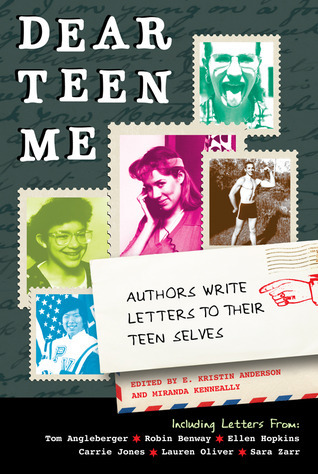 And I would hope that by sharing my own letter, and by highly suggesting others read Dear Teen Me, people can read this book and really relate and connect to these authors, who, in all actuality, are no different than the rest of us. If you're reading this by any chance, the flux capacitor was never perfected. I'm sorry. Unfortunately, time travel was not used to get this letter to you. If it was, I would have made sure this letter would have gotten to you sooner. Way sooner. Because, your loneliness goes way back to when you were in third grade. You always knew you were different. You weren't outgoing like your twin sister, and you were often compared to her by many. You certainly didn't have a fashion sense like she had. You thought that since you didn't like the color pink (you've always been a blue kind of girl) and you didn't like girly, frilly things like dresses and makeup, you must be a tomboy, because what else could you be? So you went through this terrible stage where you wore boyish clothes and cut your hair uber short. I'm sorry, but *cringes* what were you thinking? But you found a place where you could express yourself. You found music. You found the stage. I know, you're thinking 'But I've been dancing for years now'. It's true you have, but you found a deeper love for it. You created a deeper connection between you and the stage. It became sacred. You joined the band and excelled at playing your clarinet and you joined all of the school plays. Music and the stage are going to follow you all the way into high school. You're going to pick up another instrument and join jazz band and play at all the football games. You're going to learn that you really can sing. And you're going to find great friends in both those places. So you must be wondering why I said you're lonely when here I am, telling you that you make good friends and join groups and such, yes? The thing is, you're never going to feel like you truly belong. You're different. You're weird. You're nerdy. You're geeky. Because of the loneliness, you don't feel like you belong on that stage. You doubt yourself and you always will. You're not low on self esteem, but you're sometimes going to feel that you're not enough. Not for the stage, not for first chair in band, and certainly not enough to write an entire book at the age of 15. (Oh, yeah. You wrote a book. You love reading and writing.) All because you feel like you don't belong in any group specifically. You feel like you don't deserve it. You feel that you don't deserve the attention even when you work so hard to accomplish the many things you'll do. You feel that people don't or wouldn't notice you. On top of that, you don't think anybody will ever understand what you're thinking, especially when your twin sister is the epitome of unrestrained optimism and confidence. I'm not saying that things will get easier and you'll learn how to outgrow it. Because you won't. You'll just learn to cope with it, push yourself even further, and learn that you don't need outside help when you have yourself. You'll eventually enjoy being alone. You're going to take Mom's words--"You deserve it" or "Don't give up" or "I'm proud of you"-- and remind yourself every now and then that while you feel lonely, people do care. People do notice you. The good thing is, you'll outgrow that terrible tomboy phase by the time you reach junior high. And from then on, you'll know who you are; you're not going to have to go through that 'finding yourself' phase. Thank God. There will always be those times where you'll feel lonely, but all you'll have to do then is pick up a book and read. Or write. Or sing until your throat is raw and play instruments until your chops are blown. Express yourself. Follow your dreams. You, dear one, are not alone on your journey through life. You are loved, you are important. You are you. Don't ever change who you are because, honestly, you made me have no regrets. Your twin and you behind stage for Wizard of Oz dress rehearsals. 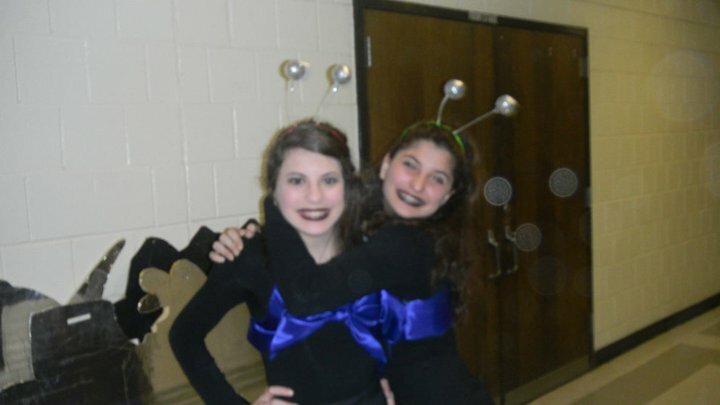 You were jitterbugs. You're on the left, by the way. 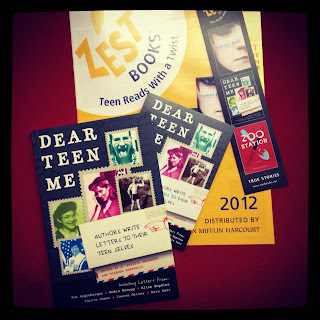 And for all of you, I have a giveaway! Thanks to Zest Books, I've got a few goodies for you. Just enter the Rafflecopter giveaway below. Yes most of it I do. Thanks for the chance to win! I'm going through my teen years now! Haha, do I look back to my toddler years where I could sleep and throw tantrums any time I wanted? YES, I DO. I do at times. Great giveaway! This is a fun sounding book! Thanks for sharing! To answer the question, there are some things I smile about but other times, I'm just so glad to be an adult! I am still in them, but I hope that someday I will. Thanks for the awesome giveaway! Well they're still happening but so far? Yes! :) Thanks so much for the giveaway! I was way more shy than I'd like to admit, but they were pretty good, I suppose. Sort of with fondness. I mean, those were some troubled years, but it definitely played a huge and essential part of who I am today. You can't be an adult without being a teen first, you know?